Lifeguard Certification Courses. Lifeguard-Pro certifications are accepted or approved by all 50 U.S. states across the nation and over 30 countries around the world. Lifeguard-Pro is widely recognized as the "World Leader in Water Safety & Rescue". World's Most Convenient Lifeguard Certification Course. Lifeguard-Pro is dedicated to reducing the total number of deaths by drownings worldwide. To accomplish this goal, Lifeguard-Pro has made public aquatic safety training more convenient and available than ever before. Lifeguard certification is as easy as 1-2-3. 1. SELECT YOUR LIFEGUARD COURSE. 2. REGISTER & BUY YOUR HOME-STUDY COURSE. Register for your Lifeguard certification course, and purchase the online Home-Study Course. Register Now. 3. SCHEDULE & ATTEND IN-PERSON TRAINING SESSION. Schedule & attend your local 1-2 day local In-Person Training Session. Pick any day you want. You do not have to wait for a group to assemble in your local area. Our instructors will teach you even if you are the only student in the class! Online Home-Study Course. The online Home-Study Course includes access to all of your course required textbooks, videos, exams, forms, and study materials. Once you purchase your online Home-Study Course, we'll email you an assigned Username & Password, so that you can immediately login to Lifeguard-Pro.org and begin your Lifeguard certification course from anywhere in the world. Start Your Lifeguard certification course now! 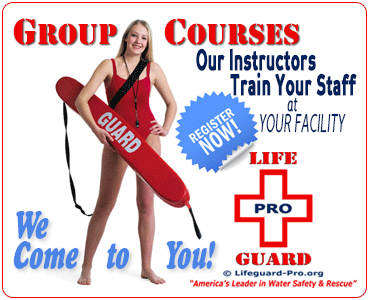 The Lifeguard-Pro online Home-Study Course allows you to progress at your own pace. You can study in the comfort and convenience of your own home, and stop and start as often as you like. Start your Lifeguarding class today! Register Now. Scheduling Your In-Person Training Session. As a Connecticut Authorized Service Provider of Lifeguard-Pro, we offer convenient In-Person Training Sessions in every major city in Connecticut. Simply request a convenient training date in your local area, we'll take care of the rest. Our instructors will teach you--even if you're the only candidate enrolled in the class! No longer do you need to wait for a group to assemble in your local area. Register Now. Participating in Your In-Perston Training Session. After completing your online Home-Study Course, attend your local 1-2 day In-Person Training Session on the day that you reserved. The Lifeguard-Pro In-Person Training Session will teach you all of the physical skills required for your certification. Register Now.